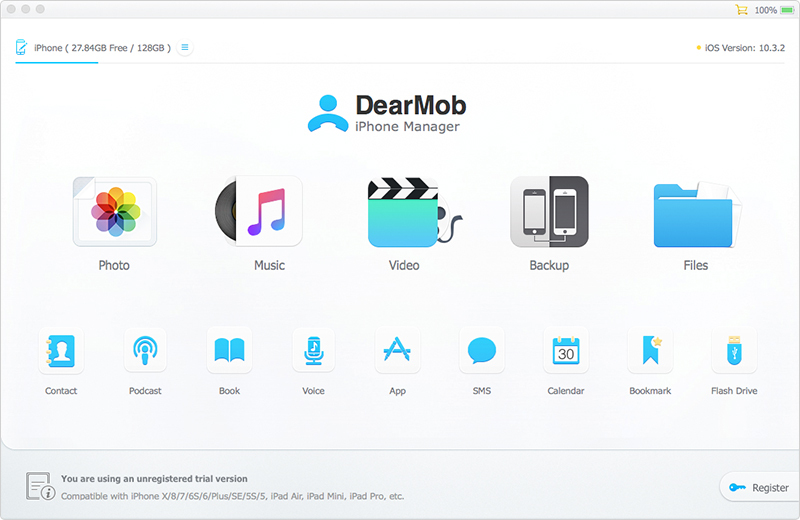 DearMob iPhone Manager is the ultimate choice to manage your iPhone with power, easiness and safety guaranteed. You can transfer files by one or in batch between iOS device and Mac at extremely fast speed, backup & restore all your iPhone/iPad/iPod Touch data with only one click, manage iOS files by category: photo, music, video, book, contact, Podcast, iTunes U, ringtone, Voice Memos, App, Office files, SMS, calendar, bookmark, etc., and also turn your iPhone as free Flash Drive. No complex configuration, you are able to manage your iOS data in a secured way without any data loss. Besides you can encrypt the data/files with passwords to keep it 100% private. Key Features: 1. Selectively transfer photos, export HEIC photo as JPG. Create, modify, delete photos/albums. 2. Export/import music without iTunes. Add, edit, delete songs & playlists. Auto convert Apple-unfriendly format to MP3. 3. Get 4K videos off iPhone to free storage. Convert MKV, AVI, FLV, etc. to MP4, compress large videos in case. 4. Backup all your iPhone, iPad, iPod Touch data and restore it to any iOS devices. 5. Save contacts as VCF/PDF/TXT/HTML. Backup SMS, download pictures in message to Mac. 6. Manage your Podcast, iTunes, and Voice Memos, create your own ringtone with iPhone music. 7. Convert ePub books to PDF/TXT/ HTML for Kindle. Add new books to iPhone. 8. Install Apps that are not in App Store without Jailbreak. Manage App files, Office files and more. 9. Able to encrypt and decrypt local images and videos on Mac, and select transferring iOS files with encryption, including photo, video and contacts. 1. Support for the latest iOS 12.1.1; 2. Improved iOS data loading efficiency; 3. Support deleting iPhone photos imported from PC/Mac.